I don't know about your kids, but mine are always bringing home papers from school. Class work, artwork, upcoming events and fundraisers. Sometimes I wonder how there are any trees left in the world! Four years ago when GG was in Kindergarten, I started the Wall of Fame. Any papers she brought home with a good grade on them would get hung on the wall. As more papers came home, I would switch out the old with the new. She loved seeing her good work displayed for everyone to see. Using the patterned paper, cut it to fit the front of the case. Cut a 2 inch strip of the plain colored paper. Write your message on this strip. Glue to the top of the patterned paper. Glue the paper to the front of the case. Glue a clothes pin on the front, towards the bottom so you don't cover your message. Cut a piece of string or yarn to your desired length. Duct tape it to the back of the case. 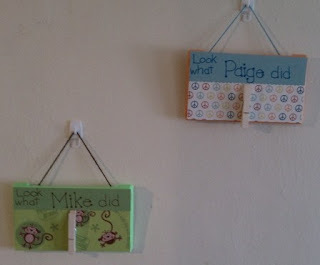 Pick a spot on your wall where you want to display your child's work. Hang you wall hanger. I used the Command brand micro hooks. If you use these, wait at least an hour before you use them. 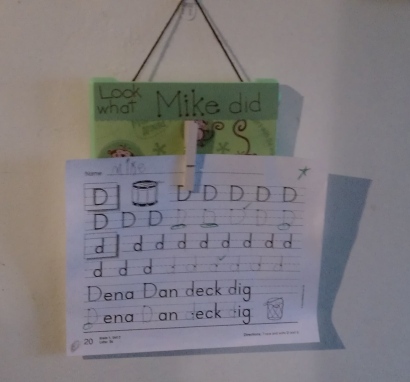 When your child brings home work worthy of displaying, you can proudly hang it on the wall for everyone to see. good job! I bet they love the new holders. That is very cool... And will come in handy in my house. Thanks for sharing! Very cute!! I love the designs you used for the kids. So so cute! What a great idea. Never would have thought to use a movie case-genius! that is so neat.. YOu should come and share this on Friday for my Round Robin.. I want to make those..
Have a great Labor Day..
What a neat idea!!! My son goes to a learning center and he brings home tons of artwork and I have been trying to figure some way to display it, plus I like that this reuses the old VHS tape cartridges! OH yeah... It is so good to have you link up.. Have a great weekend.. Thank you..